Today I’m thrilled to have Ilana Wechsler on the show. Ilana is someone who I met randomly at the Traffic and Conversions Summit in San Diego. She founded Green Arrow Digital where she runs pay per click marketing for other businesses. In fact, her bread and butter is the Google Display Network which is the only ad network that I have never been able to make profitable. So today we’re going to learn how to run profitable Google Display Network ads. You’re listening to the My Wife Quit Her Job Podcast, the place where I bring on successful bootstrapped business owners and delve deeply into what strategies are working and what strategies are not in business. Today I have Ilana Wechsler with me on the show. 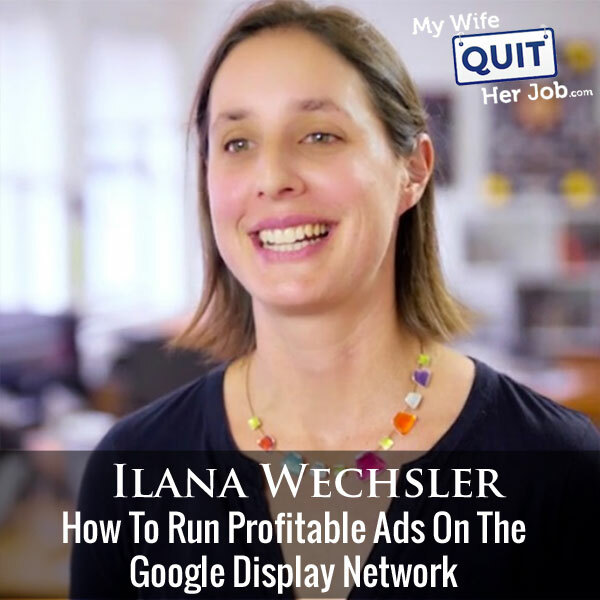 And Ilana is an expert at running ads for the Google Display Network and actually have a long history with the Google Display Network or GDN for short. I have never ever been able to get those ads profitable except for retargeting ads. So Ilana is going to teach us how to do it the right way. But before we begin, I want to give a quick shout out to Klaviyo who is a sponsor of the show. Always excited to talk about Klaviyo because they are the email marketing platform that I personally use for my ecommerce store, and I depend on them for over 30% of my revenues. Klaviyo is the only email platform out there that is specifically built for ecommerce stores, and here is why it is so powerful. Klaviyo can track every single customer who has shopped in your store and exactly what they bought. So let’s say I want to send out an email to everyone who purchased a red handkerchief in the last week, boom. Let’s say I want to set up a special auto-responder sequence to my customers depending on what they purchased, piece of cake, and there is full revenue tracking on every single email. Klaviyo is the most powerful email platform that I’ve ever used and you could try them for free at mywifequitherjob.com/K-L-A-V-I-Y-O. Once again that’s, mywifequitherjob.com/K-L-A-V-I-Y-O. I also want to give a shout out to Privy who is also a sponsor of the show. And Privy is the tool that I use to build my email list for both my blog and my online store. Now Privy is an email list growth platform and they manage all of my email capture forms. And in fact I use Privy hand in hand with my email marketing provider. Now, there are a bunch of companies out there that will manage your email capture forms, but I like Privy because they specialize in e-commerce. Right now I’m using Privy to display a cool wheel of fortune pop-up. Basically a user gives their email for a chance to win valuable prices in our store and customers love the gamification aspect of this. And when I implemented this form email signups increased by 131%. Bottom line, Privy allows me to turn visitors into email subscribers, which I then feed to my email provider to close the sale. So head on over to Privy.com/Steve and try it for free. And if you decide you need some of the more advanced features, use coupon code MWQHJ for 15% off. Once again, that’s P-R-I-V-Y.com/Steve. Now onto the show. Steve: Welcome to the My Wife Quit her Job Podcast. Today I’m thrilled to have Ilana Wechsler on the show. Now Ilana is someone who I met at the Traffic and Conversion Summit in San Diego, and it’s actually super random how we met. We were both hanging out at the wicked reports booth and getting a tour of the tool. And during that tour I noticed that Ilana was very knowledgeable and knew what she was talking about. She was asking really intelligent questions. So we started chatting, exchanged info, and here we are today. And Ilana runs Green Arrow digital, where she runs Pay Per Click marketing for other businesses. And in fact, her bread and butter is Google AdWords, especially the Google Display Network. So today, what we’re going to do is we’re going to pick her brain. And with that, welcome to show Ilana, how are you doing today? Ilana: I’m well, thank you so much for having me on the show. Steve: Yeah four days ago, yeah. So what is your background and what led you to create Green Arrow Digital? Ilana: Yeah, interesting question. I guess I’m not like your traditional kind of story of entrepreneurship. My background is, I used to be a data analyst actually. And I used to work in corporate like funds management. And I guess I’m not the classic story in that I hated my job and I always wanted to work for myself, far from it actually. I loved my work and was in it for 10 years, and got to work with really smart people and do really fun and interesting work. But as a female, I decided that I wanted to have a family. So when I went on maternity leave for my first child, basically, I came to the realization that family and corporate are like oil and water and they don’t mix. So I made the decision. And it wasn’t an easy decision, obviously, to choose family over my career. And that sort of sparked my journey. But it’s been, I didn’t first sort of launch into Green Arrow straightaway, actually, I had lots of failed attempts, lots of different things on the internet. I tried affiliate marketing, and that didn’t work. And so what I used to do was build AdSense websites and that worked really well for a while and I had a whole content team and a whole bunch of websites until, of course, the SEO game caught up with me. And it all came crashing down overnight. And then I thought, all right, it’s time to get serious. So I flipped the Google equation, as you could say, and started to do Google ads, because I really knew keyword research very, very well through my SEO efforts. And then yes, that was all on a more than five years ago that I made that switch. So it’s been I guess, a 19 year journey, because now my oldest child is nine. So yeah. Steve: We’re on the same trajectory, actually, because my kid is 10. And we both quit for the same reasons, spend more time with family. Ilana: Yeah, interesting. Yeah. So, I guess if I think back, like, my data analyst skills kind of have really come into play, which I never would have predicted. But it’s funny how life works. Steve: So Ilana, I run all my own Facebook ads, my own Google Shopping ads, my own Google AdWords ads, my own Bing Ads, but my Achilles heel has always been the Google Display Network. I have never ever been able to make it profitable except for dynamic retargeting ads. And so I kind of wanted to have you on the show for selfish reasons today. And I know we kind of talked about this when you were interviewing me. And I think it’s pretty rare to have a PPC expert on the podcast, who lives and breathes the Google Display Network. Like most of the people that I encounter, they talk about Facebook ads, and that sort of thing. So I thought it’d be actually interesting to see today on the podcast, how you would run a Google Display Network campaign. And I want to use my store as the example. But we can talk in more general terms as well. But first question, I guess is, do you believe that most businesses can profit from the Google Display Network? And are there just certain that aren’t cut out for it? Ilana: Yeah, interesting question. I think, yeah, I would say it’s probably not for everyone. It probably wouldn’t be for your local general store, for example, I wouldn’t suggest them. But I’ve struggled to find a niche or niche in American terminology that it wouldn’t really work for. The success with the Display Network really hinges on what offer you’re showing. And I think that’s kind of the biggest piece of the puzzle that people struggle to get right is, what is your offer? I kind of like to use it compared to Facebook. If you’ve got an offer on Facebook, because it’s the same kind of marketing, right? It’s interruption marketing, someone’s reading an article on the New York Times, for example, and suddenly there’s a banner sort of in line with their article, it’s got to capture their attention. And it’s got to be compelling enough. Same as Facebook, right? Obviously, you get much less text and all that kind of stuff. And we can get into all that the nitty-gritty a bit later, but the same style of marketing. So it’s got to be the right offer, and therefore the success on whatever niche or industry you’re in really hinges on what you’re showing people. Steve: So what is the main difference would you say between the display network and Facebook ads, because I know the display network, and I don’t think a lot of people realize this, but it’s a lot bigger than the Facebook network, right? Ilana: The GDN or the Google Display Network is huge. And I think I mean, got to think Google’s actually ever come out and said exactly how many websites but it’s over 2 million websites. So if you think of it, New York Times, or if for Australian listeners, it’s the Sydney Morning Herald. They’re basically banners or text ads on other people’s websites. So on a publisher, and I kind of I’m a bit of a big picture kind of person. If you think of it like two broad categories, you can show people ads based on the kind of the content on people’s website, be it specific news articles on the New York Times or a blog talking about yoga, I don’t know if there’s infinite examples, or there’s a whole another part of the GDN which is based on the person was called behavioral targeting. So that’s similar to Facebook in that respect. It’s based on the who, who you are showing the ad to, as opposed to the what of what content you’re showing people. Steve: So why are people primarily focusing on Facebook ads? Like why aren’t more people talking about GDN at least in my circles? Ilana: Well, if you think about it, Facebook have so much data on people, it’s because they have what’s called first party data based on what people actually input in their profile. So largely, the interest targeting is undoubtedly better on Facebook, I’m definitely not going to argue with you there. It’s some people like certain pages, and they telling Facebook a whole bunch of information about themselves, as opposed to Google who is kind of guessing. But Google draw a lot of their data about an individual based on whether they’re using Chrome browser, whether they’ve got an Android phone, whether they’re logged into Gmail, etc. So, I think that’s why they launched forever ago, Google Plus is an attempt to buy that first party data or get that first party data from individuals rather than just guessing. So Facebook is great because you can really narrow down with a level of granularity that you can’t on the individual. But also, Facebook have a share button, which is so powerful. Plus you get huge amounts of ad copy above your image or video ad. So I think that’s why Facebook is all the rage, but it doesn’t mean that you should discount the GDN because as a business owner, myself, and for all the business owners out there, you know, I personally wouldn’t put all my eggs in the Facebook basket, especially with all the latest information that’s come out now. And it’s good to diversify and create what I like to think of like a holistic ad campaign. So have my ads on multiple ad platforms to protect yourself. If for whatever reason, Facebook, might get, your ad account might get shut down, or for the multi different touch points that people use these days. Steve: Would you say that you can use the same creatives that you’re using on Facebook on GDN? Ilana: Yeah, I would say that, absolutely. And I would definitely test that. But I will also test lots of different creative on the GDA. Steve: Sure, of course, I mean a lot. I’ve lost my fair share of money on the Google Display Network. So if you were me kind of starting fresh for my own store, what would be some of the first things that you would start? What are some of the like the low hanging fruit things that will give me some profits right away so I don’t get discouraged? Ilana: Okay, well, I’d like to think of it as remarketing being really the lowest hanging fruit. I mean, somebody has just come to your website, hopefully you can track the people based on whether they did purchase or didn’t purchase. So getting those people back is often the lowest hanging fruit that you could use. So that would be the first place to start. So implement a remarketing campaign, excluding the people who have already purchased because you don’t want to show those people an ad, and showing ads to those people. When your remarketing campaign is running for a little while, the beauty with AdWords is they give you a whole lot of information. They tell you where your banners, we’re showing like what actual specific URLs displaying those banners and therefore you can get a sense of once someone does leave your website, where else have they’ve gone? What other websites are they going to that they perhaps reading a blog article on or etc. So you can paint a bit of a picture about your past visitors. Steve: Okay, and so am I looking for specific sites or am I looking for specific posts at that point? Ilana: I would just be looking for specific websites. So we did for a client, they got a whole bunch of organic traffic and we were running search ads for them on Google and then time to scale the campaign. So obviously we implemented — first thing we did was we implemented a remarketing campaign, and when that remarketing campaign was running for a little while we analyze the placements where those banners were and that’s what I’m talking about the specific URLs. And then we could see some obvious placement. So this particular client was in sort of the home improvement industry, and we could see that they were looking at various online magazines and publications about home décor, and it made sense, of course, right that they’re looking to renovate their home, they looking for styling and all that kind of stuff. So we can then use those insights from our remarketing campaigns say, hey, Google. Yes, our banners are showing on these home decor websites. How about let’s just have a placement on that website for all their traffic, not just the remarketing traffic. Steve: Okay. And then, so yes, it does. So you find these sites where your customers are visiting. And then what type of ad do you show those people? Steve: Because there’s like a whole bunch, there’s like nine different — there might be even more, I don’t know. Ilana: Nine yeah. So I know when you’re starting out, I don’t actually recommend you do all those because it’s going to cost you a fortune in graphic design, etc. So often what we do is we roll out one ad unit size first, 300 by 250, which is the most common but we will test like 10 or 12 different designs and offers, very different designs. I’m not talking about one’s got a green button, one’s got a red button, like wildly different designs and use that one ad unit size to test creative. And then when we get the winning creative or the top two creative, then we roll out that in the different ad unit sizes. Steve: Can we talk a little bit about the offer, and what the creative look like for that one example that you brought up with the home improvement store? Ilana: Sure. Yeah. So I like to think of really the GDN being what’s called like a top of funnel offer. So, think of, I mean a good starting point would be what’s an offer that’s working on Facebook? So that’s a question for you. What’s an offer that’s for you, for your Ecom business that’s working on Facebook? Steve: Yeah, we’re doing a free plus shipping offer where you get a handkerchief for free as long as you pay for shipping. Steve: Oh, yeah so right now I’m doing a free plus shipping offer. Ilana: Okay, sorry, I lost you there for a second. So yeah, you’re running a free plus shipping offer. Is that right? Ilana: Perfect. I would totally do that on the GDN. If you think — put yourself in the mind of your target customer. I know you’re in the sort of the linen, the wedding industry. Ilana: Somebody might be reading a blog about getting their makeup done for their wedding day. And they might see a banner there for the [inaudible 00:16:39]. That’s right. I’ve got to get these napkins created, and here’s a free plus shipping offer. Absolutely, you should test that term. Steve: Let me ask you this, would you say that like Facebook, would you recommend a video ad, or do text ads work just as well? Ilana: I would definitely test a text ad, a bit of a tongue twister. I would definitely test that. Most people forget that you can run text ads on the GDN and that’s a common kind of little gotcha that people forget. But I would also test just a standard image ad. So the 300 by 250, not like Facebook, where you have a 20% text rule on the image. You can have as much text as you want. You just need to have your business name or logo on there so they kind of — it looks like you’re a proper business really. Steve: So it’s interesting. So you test both. But can you just kind of discuss like the pros and cons of image versus just like a regular text ad? Ilana: Well, they’re different. So as a publisher, you can control what kind of ads you’re willing to have on your site. So you’re catering for the people who don’t want banners on their site. They only want text ads versus people who only want banners and no text ads, etc. So it just almost like two different placements. So if you were to browse any kind of website that allows Google ads on their website, you’ll see the different ad unit sizes that that website owner has allowed. Does that make sense? Steve: Yeah, it does yeah. Ilana: By having those multiple options, you’re catering for the different allowable placements that people have permitted Google to put an ad on there. So let’s say I own a blog about winning makeup for example, I’m not going to let Google put any ad on there. Let’s say I only want one of those both the 300 by 250, I don’t want one of those leader board ones, so that’s the only banner size that will be allowed to show on my website based on what me as a publisher have chosen. I see. And then certain sites will only allow text ads and not image ads I would imagine that. Ilana: Correct, that’s right. Yeah. Steve: Okay. So you’re doing both just to kind of account for both. And you need some sort of offer it sounds like a lot like Facebook. Ilana: Yeah. So I wouldn’t kind of go — I’m a bit of a direct response person, I wouldn’t go for the generic branding purely because I’m a data driven person. So I would definitely do some kind of offer so that you can get people to make a response. Otherwise, they’re going to see your banner and most likely not do anything. Not that it will cost you anything, because most people pay for ads for an impression on Facebook, on Google, you only pay for click. So you will get a ton of free branding. But really, it’s all about getting results, right. So I want people to actually take action. Steve: Can you give me some examples of offers for your clients that have worked pretty well? Ilana: Yes, so yeah, we had with this Home Improvement client, we had a free guide sort of related to that industry. Ilana: Yes, exactly, just a PDF. For a different client we had, they were running a free video course. So, we showed banners regarding the what did the free video course problem solve. And that’s like a PLF kind of style video course that they were running. And actually, what we did do was, so this was the video course that ended after four days of email. So we then created actually a remarketing campaign in Google and the final offer was a $1 trial for three days for a membership. We then stripped out the people who had actually registered for the video course, delayed the campaign by four days, and then showed them a banner for the $1 trial for three days. Steve: I see. And when it comes to running these ads, can you give me any sort of guidelines on like what a good click through rate is, and that sort of thing, some of the metrics. Ilana: So you will get a really low click through rate on the GDN. It’s not like the Google Search Network, where you can typically get five to 10% click through rate on often more purely for the fact that there is no intent there. But that’s okay because you don’t pay for an impression; you only pay for a click. So you will get — I mean, I’m usually pretty happy with a 1% click through rate on the GDN. But I don’t really look at click through rate personally, I look at conversion rate. Of the clicks I’m paying for, how many of them are turning into leads? That’s the metric that I run the GDN by. So looking at my overall cost per lead, what am I paying for a lead on search versus what am I paying for a lead on display, and then hopefully drill [ph] they’re cheaper because they generally will be because search is so expensive, the GDN is significantly cheaper. And then once we do get an appropriate cost per lead, hopefully, we can then drill down more into the campaigns and build out the GDN more to get more of those leads, because I like to think of… yeah sorry. Steve: I was going to say, does the GDN work just like regular AdWords where like your higher click through rate kind of factors into how cheaper clicks are, and like your quality score? Ilana: Yeah so it does kind of behave a little bit differently. But it really depends on how you kind of structure your campaign. So I would say to people, there’s a little common gotcha that people have is that the default setting within Google is when you create a campaign, you might do search network with display select, so that’s combining the Search Network with the display network. If you are running a GDN campaign, you want your display campaigns to be display network only, because then you will be able to analyze that network on its own. Does that make sense? Ilana: And you create it very, very granularly. So I mentioned before that you can target certain websites that are displaying certain content. So, in your niche, you might want to be on as I said, the wedding makeup blog, or any kind of websites that mentioned weddings and wedding dresses, and all that kind of stuff because that’s the kind of person you’re after is somebody who is getting married, right? Or you could target based on the who, so based on behavioral. So Google know a bunch of information about where we’re going, websites we’re going to, so they have a whole bunch of behavioral targeting. One of them which is one of my favorite actually is called in market. And this is based on really short term behavior, what websites have I been going to in the last two weeks, for example. They’ll know if I’m going on the wedding makeup blog, etc, etc, because I’m using Chrome, for example. So one of the in market categories before recording this podcast, I knew you would kind of ask me a question around this would be somebody who is in the market for bridal wear, that kind of person who is looking at wedding dresses would be your target customer. So you can target those people who are in the market for bridal wear. Steve: I see. So there’s literally an option where I could say this person is in the market for bridal stuff. Ilana: Exactly. There is a specific in market category for that one. Steve: Is that only — is Google only tracking people who are using Chrome for this? Ilana: Chrome, Gmail, Android phone users. Steve: But not like someone on Safari, for example, it won’t track those people, right? Ilana: They might get you from — it sounds really bad, they might be able to track you a different way if you’re logged into Gmail in Safari. Steve: Okay, so this sounds really powerful. So you can actually target people who are actually in the market to buy something in general even? Ilana: Exactly. That’s right. And it’s based on very short term behavior. So for my home improvement client, we were targeting people — one of them was people who are in the market for Roofing Services, another in market category was for people in the home improvement area. So there were specific in — there’s over 500 of these in market categories, which is really based on that short term behavior versus what’s called affinity audience, which is really based on who you are as a person long term. So, for example, my affinity category would be I mean, like cooking. So I might not necessarily have looked at some recipe websites in the last one or two weeks, but over time, and my long term behavior has been that I do look at cooking recipe websites, etc. That’s probably my least favorite one, I’ve tested that a lot personally for my clients, it hasn’t worked so well. I find that the best results that I get for my clients has been this in market one. Steve: So this in market, it sounds really powerful. It sounds more powerful than Facebook, right? Because Facebook doesn’t have any search data to show intent, right? Ilana: Exactly. And actually, for best results I get, we’re going to get a little bit technical here, so forgive me, but we will layer, so will overlap the in market let’s say bridal wear targeting with keywords or with a topic. So it’s like, forgive my math reference here, it is like a Venn diagram overlapping those two circles on top of each other to really steer Google in the direction I want them to go. Steve: Okay, and so all right, so in my case, I’d be targeting like wedding blogs, for example, and then I would layer on search intent to purchase bridal wear, how much would I bid? Like, if I’m just starting out like, what’s a good bid, how do I know what to bid, and how do I kind of monitor the campaign? Ilana: Yeah, so this is an interesting topic you bring up because a huge push by Google now has been towards automatic bidding or smart bidding they call it, where it uses all their artificial intelligence and machine learning to take care of the bidding for you. And I’m personally just testing this now for my clients. And I would say it’s not for everyone. But that’s the direction that Google is heading, where they completely take the bidding. They take control over the building in terms of using context of the person versus what’s called manual bidding where you’d set it yourself. But let’s say, starting out, you definitely would do manual bidding. I would set your bid to be a dollar and see if you get impressions. If you’re getting no impressions, then you need to raise a little bit, but I’m sure building a dollar to start with would more than sufficient to get you some traction. Once you start getting leads coming in, you might find you can drop the bid a little bit, and you just play along with it there. Steve: So along with that automated bidding, I’m actually using that right now for my shopping campaigns and it’s working really well. I think you need a minimum number of conversions per week in order for it to actually work though. Ilana: Yes. So I find, I guess a non kind of e-commerce because you going for a top of funnel offer, right? Where it’s the free plus shipping or something, you do need a minimum of 50 leads per month, but I believe for shopping, it’s 100 sales a month. Is that right? Something like that. Steve: I don’t know what the minimum is, I know meet it. And it’s actually been working pretty well. Ilana: It’s 50 yes. So we’ve selected — I’m actually running experiments. I don’t know if that’s the way you did it, where we’ll split the campaign budget, so I can test it without rolling out a full-fledged campaign. Ilana: This is probably a bit advanced. Steve: So with this offer, and if I’m bidding a buck, I know I’m not necessarily paying a buck, but that seems like a lot. I guess. Okay, so let’s say I’m bidding a buck and I’m getting some traffic, how do you decide whether it’s working well, or not, if you don’t have a whole lot of conversion data, like, do you just let it run for like a week? Ilana: I would think after a week you will see some traction if you were to get some traction. So, there’s a few optimizations that you can do. So, the first thing I would optimize would be the different creative and the offer. Really you want to be sure that your offer is — I guess you want to be sure that your lack of traction is not from a bad offer, it’s from maybe it’s a targeting issue. So that’s kind of the biggest thing that’s going to really hinder the success of your campaign. Also, we’ve got a whole bunch of what’s called negative placements that we have standard that we load into every campaign. Steve: Do you want to talk about what some of those are? Ilana: Oh, I mean, like, it’s a lot of these like, weird websites like these dot infos, dot XYZ, just kind of really bad placements, because if you think about it, on the flip side of the AdWords is the people who earn income from these ads, right? So the AdSense, so people build these content websites with the sole purpose of generating AdSense and they’re pretty crappy websites. And actually, they’re not humans really going there. It’s these bots and bots click on the ads and all this. So there’s a lot of let’s say there is some degree of click fraud, which Google are pretty good at preventing, but we just add the extra layer of defense in there to prevent those placements happening at all. And if you want, like I can make that resource available to your listeners if you want. Steve: If you go with the method that you kind of advised me where you run retargeting first and figure out what sites that people are going on first, you’ll never run into this problem, right? Ilana: No you shouldn’t, no because it’s retargeting, exactly yeah. So going back to the retargeting, also what you could do in addition to running a retargeting campaign is you can actually go into your Google Analytics account in the audience section and see what some of those in market and affinity categories that you can use. So basically, analytics is telling you, hey, based on everyone who’s come to your website, these are the categories that they fall into, based on the visitors or people who have actually purchased. So you can use those, I mean, you probably, I don’t know if you’ve noticed it in your Google Analytics, those categories. Those are the exact categories that you can use on the GDN. Steve: I see. I actually have not visited GDN in a while, but okay, I get it. And okay, so let me ask you this. So my average order size is on the order of $60 or so, would you say there’s some sort of minimum threshold to get this working? Like I know your home improvements, I bet the average order size is a lot higher, right? I’m just trying to get an idea of the cost compared to like running a Facebook campaign? Ilana: Well, it really depends on the targeting you do. And the thing is, you don’t have to have a huge GDN campaign. You might find, you just want to run a couple of placements and a couple of in market targeting and that’s it, you might find that’s all you want to do. You don’t have to scale it out hugely. And yeah, you might be like you’re in a pretty specialized industry, that maybe there isn’t a lot of GDN placements, that would be really, really good for you. Obviously, you would see how they’re performing at a campaign level to work out, is my cost per lead here too high? If it is, I’m just going to turn that specific part of the campaign off. And this is kind of where account setup and structure is very important to set it up in a very granular way so that you are armed with that level of insight to go, this specific in market like the bridal wear is not working. Let’s just turn that off. But the other one is working very well. Steve: I remember when we had talked when you interviewed me that there were certain sites for example like, I could place my handkerchiefs on like eBay in a wedding handkerchief search. Ilana: So that’s what we did for an e-commerce client. They were selling something — I obviously can’t reveal the industry, but they was selling something that was quite obscure, and those particular items were for sale on eBay as well as we’ve got a website here in Australia called Gumtree. I’m not sure if you have it over in the States, it’s pretty big. It gets a lot of traffic. And how we discovered it was we looked in the remarketing placement. So people would go to their website but then they were also going to eBay and Gumtree. So they were like, hang on a minute, of course, right. So we created a display GDN campaign targeting the placement of eBay. But we overlaid the key word of the product so that we were only there for when they were looking at the listings on eBay. So rather than being on all of eBay, that’s not really relevant. We want to be in the listings where people are searching for that product on eBay. Steve: Yeah, that makes a lot of sense. And I do want you to comment on doing keyword versus direct placement versus the other type of — the interest based. Steve: The behavioral yes. How do you merge all of them? Like, when is a good time to use keyword? Like my AdWords campaigns are running really well. Does that mean I should try going for a keyword type of targeting? Ilana: I would go for a quite a general type keyword. Like you wouldn’t type in a keyword that’s very product like specific, like probably going to ruin it, but whatever is the linen and the serial number. Steve: I was thinking weddings. Would that be like a keyword that I might? Ilana: Yes, exactly, or handkerchiefs, something like that. But I would go broad; I would go top of funnel keyword. And I wouldn’t really do just that, I would layer with let’s say, a topic of weddings. So I kind of like to do those two, the Venn diagram, the two circles together to kind of give Google a bit more guidance of what I want. So yes, I want the keyword of weddings. And I want to on the top of that layer in a topic. Maybe I want the keyword of weddings with the market category of bridal wear, etc, and mix and match that way. It’s kind of like coordinates on the globe. Steve: Yeah, and this is actually when I ran into problems. I remember when I was using — this is kind of why I’m asking this. Like when I used keyword — and back in the day when I did this, like those other affinity audiences actually didn’t exist at the time. And when I did it, and I did keyword targeting, that’s when I ran to a lot of problems like they were showing my ads on like apps, all these crappy websites, like the ones you were talking about. And it was just out of control. It was like playing whack a mole. Ilana: That’s right. So this is why you’ve really got to rank Google in. So you mentioned apps. That’s really good because what you can do is, so I don’t really like showing ads on apps. There’s a lot of inadvertent clicks and I know it from my own kids, they’re on the iPad playing on these apps and they’re clicking on ads all the time. And they’re like, no, I don’t want it. So there’s a lot of wasted ad spend that comes with being on apps. So you can actually add in a negative placement called AdSenseformobileapps.com that will prevent all your ads from showing up on any apps. Steve:I guess too, I’m trying to — what I’m trying to get from you right now is like a logical progression. So you mentioned start with retargeting. You figure out where your ads are being shown and then target those sites first and layer in a fit any audiences. Ilana: So I would separate them into different campaigns. So yes, start with remarketing, that’s working leave that alone that’s its own campaign. Work out what placements are working really well based on your remarketing campaign, and that’s a second GDN campaign, it’s called the direct placements campaign. And you’re just running alternate camps, so you create a different ad group placement, and you see how each of those URLs go on their own to get all their traffic. Steve: So one of those isn’t working that well, do you actually try to dig a little deeper and figure out what pages are converting? Ilana: Not really no. If it’s not working, I would just turn it off or try a different offer or a different creative. Steve: Okay, the reason why I’m asking that question is like, back when I did this, there was like, I remember I found this one page, there was only one page that was converting and perhaps I was just going to granular. But I remember everything else was not working that well, except for that. Steve: It’s too much work. Ilana: It’s too much work and it’s too granular, whereas somebody might browse around a little bit and I prefer to capture the whole URL. I mean, it’s different. Like, I wouldn’t do New York Times as a placement; I would overlay New York Times with some kind of keyword like category, etc. Even if you’re going for a pretty obscure blog or the online magazine kind of thing for particular client, I just go for that whole URL. I see. So, for even your direct placements, you are overlaying keywords as well as affinity audiences and behavioral? Ilana: If that URL, if it’s a really big domain. Ilana: Yeah, like the New York Times I would definitely overlay or eBay, I would overlay. Steve: Okay, and so the direct placements, retargeting that’s low hanging fruit, and if you want to scale beyond that, is that where you start going more general with interest — not sorry, with keyword and behavioral? Ilana: Yes, yes, that’s where you can really scale out your campaign. So I would start in one region first. Once you get a good targeting metric, then you can roll out for different regions because there’s no reason why it wouldn’t work in other locations. Steve: If I know my customers are in a certain state primarily, would you recommend further like only showing to people in those geographical regions as well? Ilana: It ultimately comes down to what are you paying for that lead in that region? So you might want to separate it by regions because you might find that different states you pay too high, you pay too much for the lead and then you can pretty easily turn it off. So you might want to set it up that way to start with if the cost per lead, if you’re really monitoring your cost per lead. So generally, we separate things out by country and then we can dig further deeper into certain regions. But with our clients it doesn’t really kind of get to that level. But I mean you know your business so well, if you find that certain states work really well then yeah, I would say just start there, see what the cost per lead is there. Once it’s under your magic threshold of whatever you’re willing to pay for that lead, then that can just run all the time. This is the beauty of the GDN I find is it’s not like Facebook where often your Facebook ad that’s working really well and then for no apparent reason it just dies, nobody knows why, it just suddenly go south for no explanation. Whereas the GDN it’s very reliable, it’s very consistent traffic. Steve: That was my next question actually. Like how often would you rotate ads, or do you even need to rotate ads do you find with the GDN? Ilana: It depends on the audience size. So, I think that’s another kind of mistake people make especially for remarketing is they’re just loading basically one form of creative and that person, that poor individual only for you don’t have a very big remarketing list is just seeing that same banner over and over again, which you don’t want to do because people will just get annoyed and they’ll just get upset with it. So, I would definitely rotate creative. But if you’re dealing with a really large audience, much like Facebook, we’re dealing with a large audience on Facebook, there’s no need to kind of rotate your creative as often as if you’re dealing with a remarketing audience, for example, the audiences are much smaller. But Google will tell you the approximate size of your audience. Steve: You know, one thing that kind of blew my mind the last time when we spoke was the fact that you can use GDN to make your regular Google AdWords ads and your shopping ads perform a lot better with RLSA. So if you wouldn’t mind just kind of defining what that is and talking about how you run those campaigns in conjunction, that’d be great for the audience. Ilana: Yeah, sure. So RLSA stands for Remarketing Lists for Search Ads. So most people know remarketing is these banners that we’re talking about on other people’s websites. You go to let’s say I go to your Bumblebee Linen website, I leave being the bad visitor that I am and I don’t purchase and then suddenly I see your banners on other people’s websites, what you can do, a nice compliment to a remarketing campaign is Google will know the fact that I’ve been to your website, but then if then I type in napkins, something very general, I can say, hey Google, this person was on my remarketing list, they’ve typed in like a real top of funnel keyword, show that person an ad. Steve: I was going to ask, so traditionally GDN ads are cheaper per click, right? And so you can kind of build a remarketing list with GDN and then convert the sale with search ads. Ilana: Exactly. And that’s often what we would do. So we’ve got Facebook campaign running, we’re running maybe we’re promoting content on Facebook, maybe we’re promoting — I don’t do this a lot but some people do promote content on the GDN, build a remarketing list. And then when that person is searching for something, then we’re willing to pay for that search because search is expensive. I mean, it works very well because there’s intent, you’re sliding your business card under the nose of someone at the very instant that they’re looking forward. It’s an amazing advertising opportunity. But you pay for that privilege. So how about you only pay for the people who are on your remarketing list, and then you’re moving them along the funnel. And then you can bid from a keyword point of view on very broad type keywords, because they’ve clicked, they don’t want to be read, you know they’re interested in your content or your product, but they’ve just typed in something very general that you wouldn’t otherwise be done. Steve: Can we talk about why you wouldn’t run ads for content, like I do that a lot on Facebook, like I’ll run Facebook ads in the content and then I’ll retarget those people to get a lead like an email address from. Ilana: I mean I’m not against it on the GDN; I just don’t really do it for my clients. But if you think about it, you don’t actually have a lot of room on your ad to really talk about what the content is about. But yeah, I mean as a concept, absolutely I would, we just generally go after a top of funnel kind of direct response kind of offer. Steve: Would you say that an image ad is a lot more expensive than a text ad, then in general? Ilana: No, no, no, they would cost the same. Steve: Okay. It seems like with an image ad, you could convey a lot of information about the piece of content, right, because you have more, or as much room at least as a Facebook ad. Ilana: Well, I mean, technically with the Facebook ad, we do a lot of long copy ads above the image. Steve: Yes. Okay, I see the difference. Ilana: That’s more what I’m talking about. Ilana: The actual copy on the image. I mean, if you’re testing a banner size of the seven to eight by 19, which is a very common banner size, that’s what the leader board or actually the actual. Ilana: Yeah, one of those. You could probably get quite a bit of copy on there. And in the — yeah, I would I mean, if you find that that the content is working really well on Facebook, then yeah, absolutely test it on the GDN. And you can say you only want to be 20 cents for it and see if you get any traction that way. Steve: Would you say that in general, the GDN is cheaper per click than Facebook? Ilana: Yes. 100%. Yes. And there’s heaps you can do as well. I mean, another [inaudible 00:48:58] I guess a ninja tip I would do is with this strategy of promoting content or building a remarketing list, what I also like to do is create a remarketing list in Google Analytics. So rather than just getting everyone on my remarketing list and bidding on them, I will create an audience in Google Analytics, filter out the people who spent less than five seconds on my website, the people who may have inadvertently clicked on my ad or bounced really straight away and then use that as my remarketing audience. So hey, Google, yes, some person has come to my website. But I want the people who spent more than five seconds or 10 seconds, or even 30 seconds. And those are the people I want to remarket to. Or maybe you bid a little bit more for those people because they’ve been more engaging with your content. Steve: That’s interesting you say to build these in analytics. Can you not build these in the AdWords audience interface? Ilana: No, you need to build them within analytics, and you can do any kind of audience, so any kind of Google Analytics audience and push it through into AdWords. So you might say, hey analytics, I want to create an audience of people who based on your — if you’re doing UTM links in Facebook, everyone who’s come from Facebook, the medium of Facebook whether source is CPC or you want to mix it up and create an audience of those people to show those people a specific banner that you’re offering on Facebook. So that continuity aspect. Steve: I see. I’ve been doing it all wrong this entire time, or I didn’t have access to these features actually back in the day. I guess I kind of gave up too easily. Ilana: Yeah, I wouldn’t give up because this is really, it’s a massive area of opportunity, and it’s really where you can grow and scale your lanes beyond search, because what happens with search is this is a classic conversation we have with clients. We start small with search, it does well. I say yes, we want to increase budget, it’s working very well and we increase to a point where we’re buying all the profitable search traffic there is. And then they say, we want to spend more. I’m like well, I can’t make more people search for things if they’re not, so we need to come up with a different strategy. So the GDN is like that next level or next layer that you can really grow and scale. Steve: Have you ever had any success running a GDN ad just like straight to a product, or is it always some sort of offer where you’re trying to get a lead primarily? Steve: Besides remarketing, sorry, besides remarketing. Ilana: Oh besides remarketing? Personally, I wouldn’t — I haven’t had success with that. But it might be worth trying to — on the right placement, it might work well. Actually, that’s not true. I did it with eBay. That worked really well. Steve: Oh yes okay. And you were pointing just to a product on that one. Ilana: Exactly. Yeah. Because I knew they’ve searched for it. They’re on eBay. They’re on that category page for that product. And we linked straight to that product in the banner. Steve: Okay. Yeah. So that’s really powerful that you can build the audiences in analytics because you have access to every parameter on your entire site in analytics, right? Steve: No, it makes sense, yeah, totally makes sense. Ilana: Yeah. So, filter out the people who spent less than 10 seconds and then only show those people a remarketing ad. Steve: It’s funny like all these options, it seems to mimic Facebook. It just had to dig a little deeper to know about them, it seems. Ilana: Yeah, absolutely. And Google is getting much better at their targeting, I would say there’s some been a huge amount of R&D that they’ve put in with a lot of their interest targeting. And Facebook has always been superior on this front even with their lookalike audiences, if we’re talking Facebook speak. Google has got their equivalent of what’s called similar audiences which are getting better. So yeah, you can create a similar audience based on your remarketing list or etc. Steve: Do you use those the similar audiences? Have you had much luck with those? Ilana: I have tested them for some clients; it’s worked for some but not for others. So I think it’s getting there. It’s a question of how much data they’ve got on their particular the size of the remarketing lists. You might have a business or for your listeners, they might have a business that has a really large YouTube channel for example. You can remarket the people who have engaged or watched a video on your YouTube channel on the GDN, and you can integrate all your assets into the GDN. Steve: I see. Yeah, that sounds like it’d be really powerful. I can’t wait to try all this stuff after we talked. Steve: So Ilana thanks a lot of thanks a lot for coming on the show. I learned a lot. It’s been so long since I’ve given up on GDN. But it sounds like with the scale it’s a lot bigger than Facebook and it just seems like everyone should be giving it a try. Everyone’s just been all about Facebook as of late, but GDN is just so much larger. And I feel like there’s a lot more potential there as well. Ilana: There’s a huge amount of potential, but I think importantly, it’s important to diversify where you get your leads from because yes, I’m a huge advocate for Facebook. I spend a fortune on there for my clients and it’s a great advertising platform, but you need what’s that quote that the biggest risk in your business is the number one. You don’t want one resource of your leads being Facebook, you want to diversify. Ilana: And the GDN is a great compliment to it as to complete the holisticness of all the different touch points for your client. Steve: One last question, you’re starting out, Facebook or Google or GDN for business? Ilana: It’s a hard one. It really depends on the industry. I think really what Facebook does have which Google doesn’t have is that share button which works so well on Facebook. But Facebook is getting more and more expensive, let’s be honest. So it depends on your industry I’d say, that’s a tough one to answer. Steve: Where can people find you online if they want to get ahold of you or know more about your services? Ilana: Yeah, sure. So my main website is GreenArrowDigital.com where we do this stuff for clients but we also have a whole training program on the GDN and a whole bunch of Google stuff as well as Facebook and analytics on the training page on our website. So yeah, you just go to GreenArrowDigital.com, or you can listen to my podcast and yours truly talking. Steve: Where is your podcast and what is it called? Steve: Talking Web Marketing. Okay, and are those tutorials free on your site? Ilana: I do have a whole free video course actually on remarketing on my website. That is available for anyone, if they want. Steve: Excellent. And do you take clients, because you’re based in Australia, do you take clients outside of Australia as well? Ilana: Yes, absolutely. Most of my clients are out of Australia. Steve: Excellent. Okay, I will post all that in the show notes. Ilana, thanks a lot for coming the show, once again I really appreciate it. Ilana: It’s my pleasure. Thanks for having me on. Hope you enjoyed that episode. I don’t know about you, but I’m really anxious to go back and give the Google Display Network another shot. After all it does have the largest reach of any ad platform around. For more information about this episode, go to mywifequitherjob.com/episode216. Hey Steve, long time listener and I have struggled with display ads myself. In the podcast she offered up the restricted URL list to your listeners but I didn’t see them in show notes. Can you post those? I think that’s a great starting point to avoid wasted spend on the spammy sites. Thanks for all your work. Love the show.